Re-experience the original Steins;Gate in 1080p. 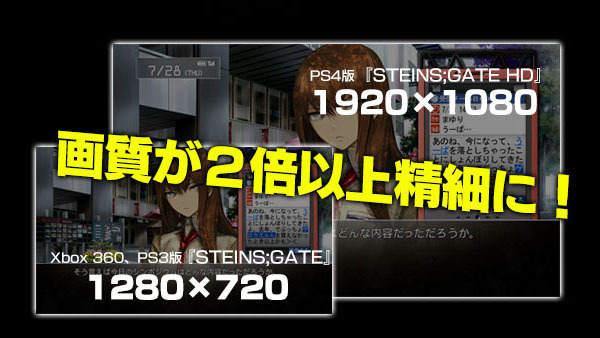 First-print copies of Steins;Gate 0 for PlayStation 4, PlayStation 3, or PS Vita in Japan will include a download code for a full HD remaster of the original Steins;Gate for PlayStation 4, Mages announced. The PlayStation 4 remaster runs in 1080p resolution, versus its previously released PlayStation 3 and PS Vita versions, which ran in 720p and 544p. Steins;Gate 0 is due out in Japan on November 19.